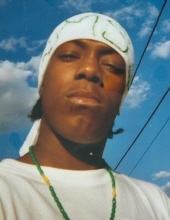 Lamar T. Coleman, 32, was born on November 13, 1986 in Newark, NJ to John Brown and Barbara Harris-Coleman. Lamar also known as Casper the Michael Jackson impersonator departed this earth on April 1, 2019 at the home of his mother who Reside in Newark, NJ, before being taken to the Hospital. Lamar attended Malcolm X Shabazz High School in Newark, New Jersey, studied at World Dance Academy, and went to Hip Hop Thugstaz learning to dance and sing. He was known by many for his many dance performances including dancing WITH THE MICHAEL JACKSON FAN CLUB FOR the WMWCA, EMERGENCY RESIDENCE PROGRAMS, HIS MANY LINCOLN PARK MICHAEL JACKSON TRIBUTES, SIGNING AT THE KING OF POP KARAOKE, and some say during Hurricane Katina. Lamar worked at Calvary Church and numerous other jobs as an adult. Lamar loved boxing and family; he will be forever remembered as a legend and the great Michael Jackson impersonator. Lamar T. Coleman leaves to cherish his memories his Father John Brown and Mother Barbara Jean Harris-Coleman. One sister Beverly Williams of NC and one Brother Marvin Williams of Newark, NJ, living Aunt Louise Harris (Ismael) Montalvo and Bettie Bullock (deceased). He leaves to cherish his memories first cousins; Anthony, Corey, Jordon, and Ronald, four nieces; Porsche, Savannah, Soloan, and Zoralda, One great niece; Ava, two Nephews; Marvin Jr, and Kodey, One great Nephew ;Ethan, and a host of other family members and friends. Lamar will be greatly missed by family, fans and friends. The family would like to extend thanks to all who knew him and shared in his love for music, dance and the love for life. This Online Memorial has been created to commemorate the life of Lamar Coleman. Leave a message on the Tribute Wall to share your favorite memories and offer words of sympathy and comfort. To send flowers or a remembrance gift to the family of Lamar Coleman, please visit our Tribute Store. "Email Address" would like to share the life celebration of Lamar Coleman. Click on the "link" to go to share a favorite memory or leave a condolence message for the family.